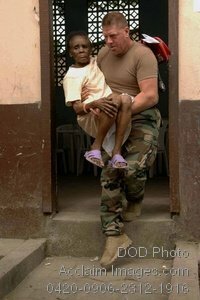 Description: Free, public domain image: American Navy Soldier Carrying a Sick Man to a Doctor in Colombia. U.S. Navy Master-at-Arms 1st Class Keith Thomas, embarked aboard the Military Sealift Command hospital ship USNS Comfort (T-AH 20), carries a patient to be seen by medical professionals in Tumaco, Colombia, June 12, 2009. Comfort is deployed in support of Continuing Promise, a four-month equal partnership humanitarian and civic assistance mission between the United States and international partners in seven countries in Latin America and the Caribbean. (U.S. Air Force photo by Senior Airman Jessica Snow/.